What is so amazing about Grace? 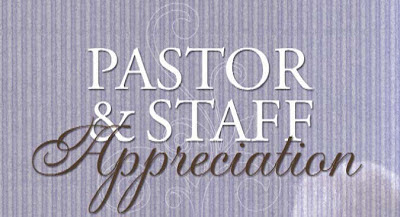 : Pastor Appreciation? Found out by reading my friend, Tony Morgan's blog that it is "Pastor Appreciation Month" in the states. You can read his thoughts on it here. Honour and appreciation is a great thing to give of course its always nice to be appreciated. But I have to agree with much of what Tony says. "Every Member is a Minister"
"Every Minister is vitally important to the health of the Church"
"No Minister is more important than another"
I get up every morning and I get to do what I love to do. Each month the members of the church put money in my bank account to pay me to do what I love to do. Each week 100's of church members work jobs and then show up to volunteer their time & talent to help me do what I do. With leadership comes some criticism. There is sadness when someone you have invested in walks away. 9 - 5 is a thing of the past and it can sometimes feel like 24/7. But the moment I see any of this as a sacrifice and not a privilege is the time to quit. I know that pastor appreciation month is not really a UK thing but maybe for the month of October we can appreciate the true hero's of the local church. Thank the guy that directs you to your parking spot on a Sunday. Thank the lady that smiles and hands you this weeks newsheet. Thank the musician who turned up to practice on Thursday evening and has been at church since 8 am this Sunday morning. Thank the Children's worker who is caring and teaching your child which in turn enables you to worship and hear God's word without distraction. Thank the guy who is working the PA, even if you think he has it too loud. But if you must appreciate a "Pastor" find one who is working a "Proper" job full time and trying to lead church on his own in his "Spare" time. He could do with your encouragement.